Here’s what’s up in the world of TV for Sunday, January 25th. All times are Eastern. 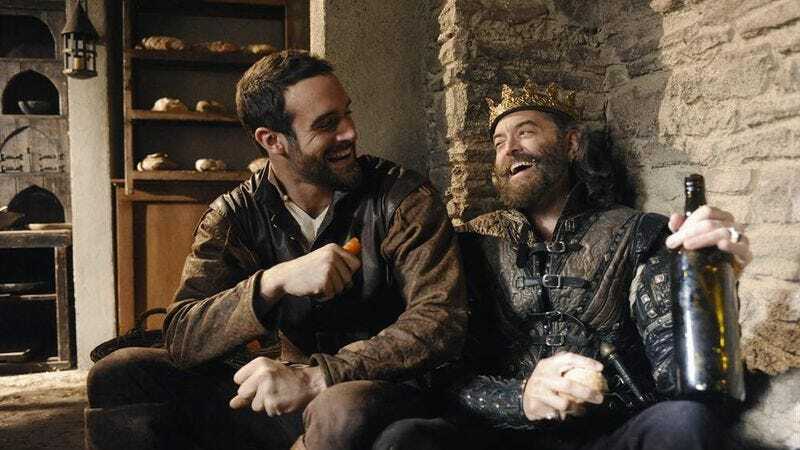 Galavant (ABC, 8 p.m.): And just as quickly as it swept into our lives with a wink and a silly song, Galavant is gallivanting out of our lives (we know, groan, but come on, we resisted that pun for entire weeks). It’s too soon to know if this is the last we’ll see of these merry medieval carousers, but if ABC’s burning them off two at a time in January is anything to go by, we suspect this is indeed goodbye. Dan Caffrey is preparing his 21 lance salute, just in case. The 21st Annual SAG Awards (TNT/TBS, 8 p.m): Zing! Nailed it. The Simpsons/Brooklyn Nine-Nine/Bob’s Burgers (Fox, 8 p.m./8:30 p.m./9 p.m.): As we are in the calm eye of the hurricane that is football season, Fox’s Sunday comedies are squeezing new episodes in while they can. This means that Dennis Perkins, LaToya Ferguson, and Alasdair Wilkins are all back on their respective beats, and that we’re now imagining a birthday party wherein the Simpsons go out for burgers and the combined force of those kids causes enough chaos to call in the Nine-Nine. One of our personal favorite A.V. Club features is back, as Gwen Ihnat taps in to tell us if the ’80s high school sitcom (and OG Sarah Jessica Parker-starring vehicle) Square Pegs is a One-Season Wonder, Weirdo, or Wannabe. Resurrection (ABC, 9 p.m.): The second season ends with everyone frantically trying to stop a baby from being born. Seems like they’re about nine months too late, but hey, what do we know. The Cabin In The Woods (Syfy, 5 p.m.): Warm up for your evening of television with an early showing of Drew Goddard and Joss Whedon’s horror movie with a twist. Australian Open: Round Of 16 (ESPN2, 3 a.m./Tennis Channel, 6 p.m.): The reality of just how big our planet is has never been more pressing to us than during the Australian Open (this is hyperbole, but only barely). Pro Bowl (ESPN, 5 p.m.): With no competitive football in sight until next week’s Chris Pratt vs Chris Evans Seahawks vs Patriots showdown, the league tries to distract us from #deflategate (and the inanity of–gate hashtags) with an all-star game. As always, we turn to our football savvy roommate for comment on this NFL adjacent situation. What’s On Tonight’s roommate? “No one cares.” Thanks, What’s On Tonight’s roommate! Saturday Night Live: This week, the hallowed stage welcomed musical guest Blake Shelton and…what’s that? Shelton took on musical guest slash host duties?! Oh. Well, we….huh. We’re gonna need Dennis Perkins to help us work through these feelings.